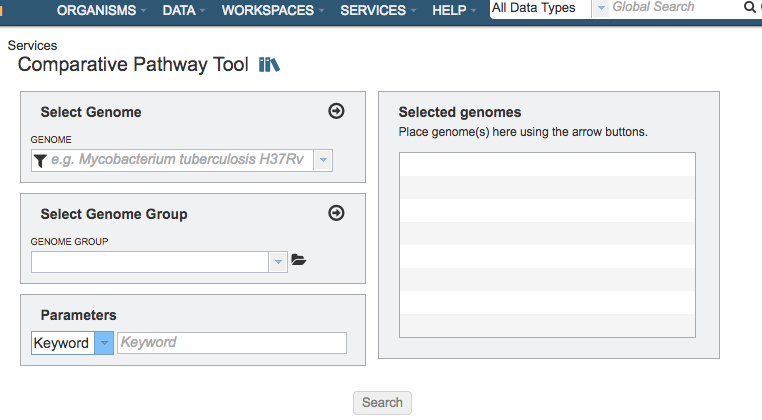 The Comparative Pathway Service allows users to identify a set of pathways based on taxonomy, EC number, pathway ID, pathway name and/or specific annotation type. 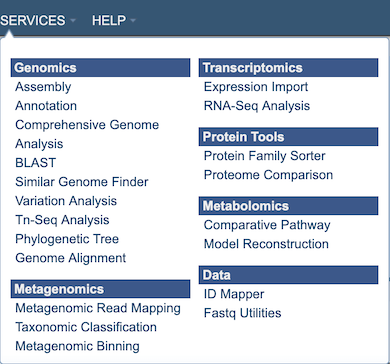 The Comparative Pathway submenu option under the Services main menu (Metabolomics category) opens the Comparative Pathway input form (shown below). Dropdown list of filter options to use refine the results. A specific keyword, Pathway ID, or EC Number can be used as a filter. Launches the Protein Family Sorter Service and, upon completion, displays a page in PATRIC showing all the Pathways that have any genes assigned to them from the genomes that have been chosen.